Comments: A game changing book. It is long, dense and takes a while to get through. But, my oh my, it is worth it. 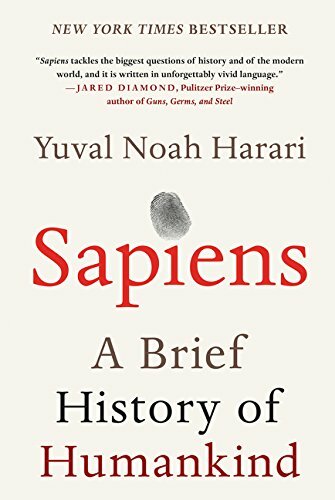 I love books that look at all of human history through various lenses. This one tells the story of Homo Sapiens and beautifully weaves in all that is ugly, beautiful and miraculous all at once. It is the best book on history that I’ve read. A perspective changer. 1. Fiction. Thanks to language, we were able to speak about abstract concepts and/or fiction. It is one of the unique aspects of our language and mental ability. This enables us to create myths and stories (religion, nationalism) that enables us to cooperate flexibly in large groups. These creative myths and stories dominate our life today – countries, religions and businesses are all myths that we buy into. And, it is this fiction that enables us to cooperate with each other. 2. Agricultural revolution. The agricultural revolution is the world’s greatest fraud story. We didn’t domesticate plants. Wheat, Maize and Rice domesticated us. Domesticated comes from the Latin word domus which means at home. It is humans who stayed at home. And, not just ate – began eating a diet that wasn’t anywhere as nutritious since it lacked variety, had to work very hard to keep these plants happy and suffer if pests or the weather attached them. But, it helped us with one metric – multiplication. More people could be supported by agriculture under much worse conditions. 3. Industrial revolution and energy. The industrial revolution has really been about our ability to convert energy into forms we can use. Steam engine then oil enabled us to mass produce and ship raw materials around the world. The prime example of this is farming – especially animal farming. We mass produce animals like never before, subjecting them to horrible conditions that deprive them of all emotion or sensory stimulation. Like slavery, such cruelty is borne, not out of hate, but out of indifference.